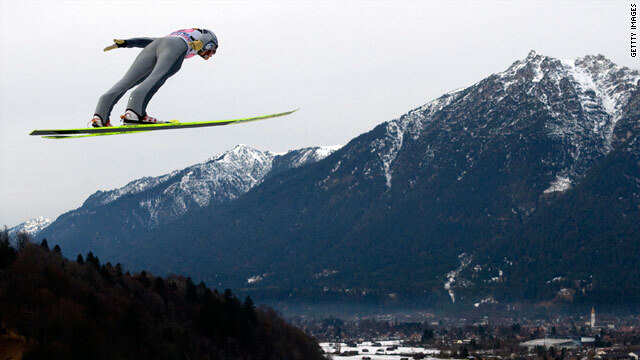 Schlierenzauer soars high above Garmisch on his way to victory in the Four Hills on New Year's Day. (CNN) -- Defending World Cup champion Gregor Schlierenzauer of Austria claimed the second leg of the famous Four Hills ski-jumping tournament at Garmisch on New Year's Day. Schlierenzauer could only finish ninth in the first event at Oberstdorf on Tuesday, but made no mistake with leaps of 136.5 and 137.5m and good style marks for a total of 277.7 points. It gave him a comfortable advantage over fellow Austrian Wolfgang Loitzl, who twice jumped 135m for 272.5 points. Switzerland's double Olympic champion from 2002 in Salt Lake City, Simon Ammann, showed he is running into form for Vancouver next February, after jumping 132 and 143.5m for 272.4 points and third place. Austrian Andreas Kofler, who won at Oberstdorf, maintained the overall lead in the four-event competition as he came in fourth with leaps of 136 and 137m for 271.9 points. Finland's five-time Four Hills champion Janne Ahonen, second at Oberstdorf on his comeback from retirement, finished sixth after jumps of 129.5 and 137m gave him 259.2 points. Kofler leads the standings with a 20-point lead over Loitzl with Ahonen third ahead of the next competition at Innsbruck on Sunday. The Four Hills concludes in Austria, at Bischofshofen on January 6. Ammann still leads the overall World Cup standings with Schlierenzauer closing up in second place and Kofler third. In other pre-Olympic news, leading U.S. snowboarder Kevin Pearce suffered serious injuries in training for the halfpipe event in Utah. Reports said Pearce hit head on the halfpipe while attempting a complex move and was taken to a hospital in Salt Lake City. He was among the favorites for gold at the 2010 Vancouver games having beaten 2006 Olympic gold medallist Shaun White in recent competitions.